The Book Club by Mary Alice Monroe released on Apr 24, 2003 is available now for purchase. 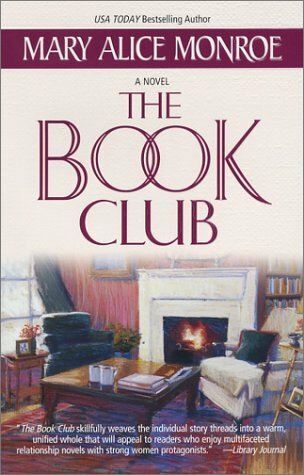 To ask other readers questions about The Book Club, please sign up. Who did you most identify with from the four friends? Tammy disregard this question. I was thinking five and typed in four. This book definitely wont be getting a standing ovation from me. This is hard to write; it's my first unflattering review but I have to be honest here. The plot is formulaic and the writing itself did not make the story outstanding. If I hadn't already lost interest by then, I really zoned out after Pg 134 where “Intelligence shone in his large, deep-set eyes and sensuality teased in his full lips”. Why do the men in these books always have sensual full lips? This is so over-done. The book was peppered with many examples of this annoying type of writing. The Book Club seemed to be all about Eve rather than about the four members of the club. It dwelled on her life extensively and only to a lesser degree, the other members lives. Awesome book! These middle aged moms are all in new phases of their lives. Everyone can relate to at least one woman and what she is going through - relationships, empty nesters, death, illness, infidelity, job loss but the thread that runs through this story is finding yourself again as a woman. It made me think. I really enjoyed this book and will be looking at some of her other books. I really like Monroe's writing style as I find it easy to breeze along and her character's relatable. I did not think this was one of her best, but still a feel good read. Five women have been in a social book club for many years. I would not say they all are good friends, but over the years the friendships seem to slip back and forth. This is what I enjoyed. These women reminded me of friendships I have had with different women....sometimes they are the best of friends, sometimes you 3.5 stars. I really like Monroe's writing style as I find it easy to breeze along and her character's relatable. I did not think this was one of her best, but still a feel good read. Five women have been in a social book club for many years. I would not say they all are good friends, but over the years the friendships seem to slip back and forth. This is what I enjoyed. These women reminded me of friendships I have had with different women....sometimes they are the best of friends, sometimes you can't relate and other times you tolerate them more or less because of your history. You fit together, even though you go home to very different lives. I think Monroe did a wonderful job of showing how a shared history kept these women together. I selected this book for my 'night' reading, aka reading before I go to sleep. I like to read light, funny and interesting books at this time, not thrillers or political subjects. Unfortunately, I often fall asleep during this time and it takes a while to finish a particular book! In reading this book, I couldn't wait to get back to it and fought the Sand Man! The story opens with descriptions of five women, each with varying issues confronting (or soon would be)them. I felt that the description I selected this book for my 'night' reading, aka reading before I go to sleep. I like to read light, funny and interesting books at this time, not thrillers or political subjects. Unfortunately, I often fall asleep during this time and it takes a while to finish a particular book! The story opens with descriptions of five women, each with varying issues confronting (or soon would be)them. I felt that the descriptions were accurate, current, and included idiosyncratic details that seemed appropriate to the issue being dealt with. It seemed that the representations for each woman aligned with friends I've known, making the stories more compelling to me. I am embarrassed to admit I read this book. I had to skip so much- but unfortunately I was hooked with the prelude. The overall story of friendship was nice, but that's where it ends. So don't waste your time, there are so many wonderful stories out there about friendship and adversity weathered, my advice look else where for such. The is my favorite Mary Alice Monroe book. Explores friendships with books. What more could one ask for! 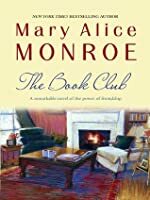 The Book Club by Mary Alice Monroe is about the power of friendship, honesty, understanding and tenderness. It is a story about five remarkable women who belong to the same book club. This is a well crafted story about these believable characters. This is a story for women in their 50's and 60's! There are many topics that will make you ponder about marriage, children, death, health........life in general. What a great book to be completely immersed in. Five long time friends have had a book club since their children were very small and they meet monthly to review and discuss books. A simple pastime for sure and very enjoyable and companionable. Over the years their friendships have become very close and they are more like family to each other. The story is about how lives are in constant change and how good friends can be the best blessing that a person can have. It is a pretty good read about 4 friends who are in a book club together who try to solve each others problems. Definitely check it out. On the surface, it is a monthly book club. But for five women, it is so much more. For Eve Porter, whose husband's sudden death cheats her of every security she had planned on, the club is a place of sanctuary. For Annie Blake, a brilliant attorney intent on starting a family late in life, it is the chance to finally let down her guard and dream of other possibilities. For Doris Bridges, it is her support group as she acknowledges her dying marriage and finds the ultimate freedom in her husband' On the surface, it is a monthly book club. But for five women, it is so much more. For Eve Porter, whose husband's sudden death cheats her of every security she had planned on, the club is a place of sanctuary. For Annie Blake, a brilliant attorney intent on starting a family late in life, it is the chance to finally let down her guard and dream of other possibilities. For Doris Bridges, it is her support group as she acknowledges her dying marriage and finds the ultimate freedom in her husband's betrayal. For Gabriella Rivera, the "perfect" wife, mother and friend who offers support to everyone but is afraid to ask for it herself, it is a sense of community. And for Midge Kirsch, an artist who has always lived her life against the grain, it is a haven of acceptance. My Thoughts: From the very beginning of The Book Club, I was drawn into the lives of the five women facing life and its challenges, and how their love of books was just a tiny piece of what held them together. Their stories flow alternately, and we see how their lives intersect, especially when they come together in times of joy and times of trouble. Set in the 1990s, in suburban Chicago, the author shows us their lives in great detail, from the ordinary moments to the tragic ones. In the very beginning, at Tom’s funeral, something happens that puzzles a few of the characters, and I kept waiting for that secret to reveal itself, for the reader to find out what that was about. I had my suspicions, but they wouldn’t be realized until the story began to draw to an end. A story of friendship, struggles, transitions, and a celebration of life…at times the tale was tedious, but the emotions and situations were real, spotlighting all the flaws of ordinary people and the choices they make along the way. 4.0 stars. I wish we could do half stars, this would be a 3.5. The writing was captivating as were the characters stories but half way through things became a bit cheesy. This review has been hidden because it contains spoilers. To view it, click here. As I began reading this story, I knew it was a story about a group of women......as I headed further into the story I found myself somewhat bored with the story and I was thinking to myself why did I start a book that was about a circle of women, because it seemed as if it was becoming predictable....there was the suddenly widowed Dr's wife with two young children, the neglected and unappreciated wife, the high power go getter wife who suddenly wants a baby, the single woman who' s art becomes h As I began reading this story, I knew it was a story about a group of women......as I headed further into the story I found myself somewhat bored with the story and I was thinking to myself why did I start a book that was about a circle of women, because it seemed as if it was becoming predictable....there was the suddenly widowed Dr's wife with two young children, the neglected and unappreciated wife, the high power go getter wife who suddenly wants a baby, the single woman who' s art becomes her children and the nurse with four children who is forced to be her families main bread winner when her husband loses his job, and then throw in a mysterious redhead for good measure who pops up once in awhile. I am not one to stop reading a book just because I feel it is boring or predictable, so I pushed on and I am glad I did! The women who I thought were the weakest and most predictable, were suddenly the strong women and vice versa! Also there several twists that took me by surprise, and by the end of the book I found myself cheering for all of these women and their stories! I enjoyed Doris the most in the story, even though she wasn't really the main character, I related to her the best in terms of growing older and seeing your children grow up and move on and then having to redefine who you are as a woman, mom etc! I must say though, as much as I cheered for her I am still skeptical about her ability to build her own tree house! Overall good story and I am a fan of Mary Alice Monroe and her style of writing and storytelling! I like that at the end the moral of the story comes out that we should live each day to the fullest, because we never know when it might be our's or someone close to us last day on Earth! Makanya, saat baca novel ini, du du du, relate banget. Saya bisa mengidentifikasikan diri saya ke salah satu salah dua tokoh-tokohnya; perpaduan Annie dan Midge lah. Ceritanya khas perempuan banget deh. Konflik yang dihadapi oleh kelima tokoh novel ini (Eve, Annie, Doris, Gabriella, Midge) adalah konflik yang sering kali dihadapi perempuan. Mungkin beda konteks sedikit, tapi tetap nyambung. Eve yang tiba-tiba ditinggal wafat suaminya. Doris yang memiliki suami bermasalah. Annie yang sangat menginginkan anak di ujung jam biologis. Midge, yang berharap kembali memiliki pendamping. Gabriella yang suaminya baru diPHK. Hubungan mereka sebagai anggota sebuah book club dan juga sebagai individu dijalin naik turun oleh pengarang. Premis dan plotnya mungkin biasa, tapi pengarang membuat karakterisasi yang melekat dengan keseharian perempuan. Yah, perempuan urban sih. Tapi begitulah, saya menikmati kisah lima wanita ini, di beberapa bagian dada saya sesak dan kemudian menangis. Book club sebagai latar menurut saya kurang kuat. Cerita bagaimana merela melakukan pertemuan book club, kurang banyak dieksplor. Bisa jadi karena kisah-kisah mereka sendiri adalah kisah-kisah yang ada di dalam buku. It was the title that attracted me to this book and I thought the quote from a different book at the beginning of each chapter was a clever idea for each one’s theme. Unfortunately though I did not find the story at all enjoyable in fact it was just plain boring. I really dislike writing a bad review as I know it is far from easy to write a novel and criticising one is something that I feel uncomfortable about. The cover stated that it is ‘A remarkable novel of the power of friendship’. In my opinion it was far from remarkable, just stereotyped stories of five women who were friends and members of The Book Club. There was Eve, unexpectedly widowed in her forties and suddenly finding herself struggling financially. Annie the successful career woman desperate for a baby before her biological clock fails her, suddenly has to come to terms with a much more serious health issue, than being unable to conceive. Doris is the mousey wife, with the demanding and bullying husband; who becomes so depressed on discovering her husband’s infidelity. Midge the artistic free spirit whose mother suddenly decides she wants to be more involved in her daughters life and finally Gabriella the perfect friend, wife and mother, coping with a long term unemployed husband. To me this was just another conventional romance with absolutely nothing to surprise the reader. Every summer I read really crappy books. It's like eating a bag of chips. You don't want to do it often, but on occasion, it tastes really good. Usually after a book of two, I'm satisfied and ready to go back to all those "important" books. Read too many, and it's like eating the entire bag. You feel sick and bloated afterwards and willing to swear them off forever (and by forever, I mean until the next summer). This was surprisingly not terrible. I can't really say much more than that. It's no T Every summer I read really crappy books. It's like eating a bag of chips. You don't want to do it often, but on occasion, it tastes really good. Usually after a book of two, I'm satisfied and ready to go back to all those "important" books. Read too many, and it's like eating the entire bag. You feel sick and bloated afterwards and willing to swear them off forever (and by forever, I mean until the next summer). Had to grab a book in the airport as I'd forgotten mine! There were a surprising number of errors in this copy and I'd log them on typoze.com, but I handed this to a flight attendant when I finished it. Also to note: there's a Tattered Cover store in Concourse B of the Denver International Airport. No need to buy books Had to grab a book in the airport as I'd forgotten mine! I gave this book a 4, perhaps partly out of sentimental reasons. It's the last book "my" book club is reading before disbanding and this seems like a good one to end on as it outlines what is good, and important, and unique about sitting down with a group of women with different perspectives and in different places in their lives and just listening. "Kita akan terus berubah, mengambil berbagai keputusan baru, lalu menjalani semuanya. Memang itulah isi kehidupan, hanya serangkaian panjang pilihan"
Didn't care for it to much, my book club has more drama! I love this book! I related to it on so many levels. There are several highlights I will save to my a "Quotes From Literature" file. Here is one" "....the moon. It hung in the sky beside her, a silent but steady presence - inspiring, enlightening, timeless, changing. Sometimes fat, sometimes think, sometimes glowing. Sometimes those blotches were right there on the surface for the world to see. Some nights the moon dominated the sky, other nights it slipped quietly through veils of clouds. Somet I love this book! I related to it on so many levels. There are several highlights I will save to my a "Quotes From Literature" file. Here is one" "....the moon. It hung in the sky beside her, a silent but steady presence - inspiring, enlightening, timeless, changing. Sometimes fat, sometimes think, sometimes glowing. Sometimes those blotches were right there on the surface for the world to see. Some nights the moon dominated the sky, other nights it slipped quietly through veils of clouds. Sometimes it was mysterious, other times it was exposed, scarred with the prints of men's heavy boots. Tonight the moon seemed to be smiling with her, keeping her company with a glow that seemed to radiate from within. It filled her with its golden light. The moon had to be a woman, Doris decided. " Another: "Careful. Retreats can be dangerous. You never want to go back to the real world," Doris said wistfully. "But sooner or later winter comes with all that snow and ice and its pretty lonely cut off from the outside." Yet another: "My story will change, and so will yours. We'll just go on changing, making a new set of choices, then living them out. That's what life is anyway, just a long string of choices." Another departure from my usual crime fiction fare. Five women have belonged to this book club for years and the events of this story show how it is about much more than just reading books. Each of the women go through life changing events and the monthly book club provides a point of stability when all around is rocky. The primary voice is Eve whose husband dies suddenly while he is away on a regular trip. Her life is shattered and all her security is destroyed. For some months she feels unable t Another departure from my usual crime fiction fare. The primary voice is Eve whose husband dies suddenly while he is away on a regular trip. Her life is shattered and all her security is destroyed. For some months she feels unable to meet with the Book Club but eventually finds her way back to them as a group. The action takes place over nearly 18 months and each of the women goes through a crisis where the support of the others becomes pivotal. I thoroughly enjoyed this book. You'll see a bit of yourself in each woman portrayed but one will stand out with certain familiarity for each reader. My favorite part was this, "Friendships were easy when life was going smoothly. What was hard was to be there for your friend when life got rough and the friendship was neither easy nor fun. The challenge was to forgive the friend when she failed." That I am in a book club made reading this all the more enjoyable. There were moments in this book that shook me to the core. There were moments that brought a smile to my lips and times I could feel the sadness, hopelessness, and despair of the five women in the book club. In spite of those moments I grade this book as average. There were tedious parts of the story to plough through and I just wasn’t that interested in all of the women.